Transthoracic needle biopsy (TNB) is a safe rapid method used to achieve definitive diagnosis for most thoracic lesions, whether the lesion is located in the pleura, the lung parenchyma, or the mediastinum. Diffuse disease and solitary lesions are equally approachable. Most TNBs are performed on an outpatient basis by using local anesthesia with or without conscious sedation. Virtually any location in the chest can be safely accessed by means of TNB. These percutaneous techniques are discussed in this article. This article addresses biopsy of lesions that require transthoracic needle placement. Biopsy of the chest wall, ribs, and thoracic spine is included in Percutaneous Needle Technique Musculoskeletal Biopsy. Transthoracic needle biopsy (TNB) is performed most often to document metastatic, inoperable, or recurrent neoplastic disease or to obtain material for culture in patients in whom infection is suspected. In contrast, many physicians believe that TNB is never indicated in patients with a resectable solitary pulmonary nodule (SPN). The argument against TNB is as follows: if an SPN is malignant, it must be removed. If TNB fails to reveal a malignancy, the SPN still must be removed under the presumption of a false-negative biopsy result. Because either result leads to surgery, subjecting the patient TNB is unnecessary. This argument may have made sense in the early days of cytopathology, when a specific benign diagnosis was rarely achieved. However, such reasoning carries little weight today. For a patient who is a good surgical candidate and who is at high risk for lung cancer, surgery is the appropriate first step if the patient develops a new resectable mass with imaging characteristics typical of primary lung cancer. However, many, if not most, patients presenting with a SPN do not fit this description. 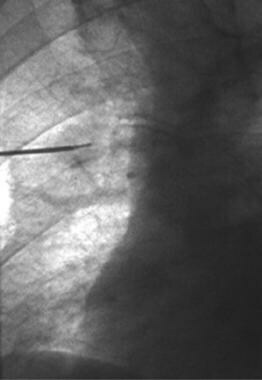 Specimens obtained during percutaneous TNB do not help in diagnosing benign solitary pulmonary nodules. When a bronchogenic neoplasm is suspected, biopsy of the lesion is often needed to determine the cell type before the course of treatment is planned. This is particularly true in small cell carcinomas, for which surgery is not the primary treatment. When surgery is contraindicated for other reasons, such as poor pulmonary function, extensive pulmonary emphysema, or previous pneumonectomy, chemotherapy and/or radiation therapy cannot be started until proof of malignancy is established by means of biopsy of the lesion. The same need to establish the cell type exists when a thoracic metastatic lesion occurs in a patient who has more than 1 primary neoplasm. TNB alters the course of therapy. [6, 7] Most common benign causes of SPN can be diagnosed with the help of TNB. With the dissemination of low-dose CT to screen for lung cancer, additional patients are required to undergo biopsy of an indeterminate SPN. Most lesions may be due to benign causes, such as granulomatous, inflammatory, or fungal disease. When results of positron emission tomography (PET) or conservative follow-up studies are inconclusive or when clinicians wish to prevent unnecessary surgical intervention in this relatively low-risk population, biopsy can be offered as an alternative. In such cases, the diagnostic yield for benign disease should be maximized by using the appropriate technique and needle. With the advent of PET-CT and combined PET, a new group of lesions are being examined with biopsy. PET images are used to target the exact location of biopsy to the site of metabolic activity, especially in suspected recurrences, treated neoplasms, or large lesions with necrosis. Lesions that are morphologically too small or initially thought to be benign but that have substantial metabolic activity may be successfully evaluated with biopsy by using preprocedural PET images as guides. In the patient with high risk of postbiopsy complications, a positive PET study may obviate tissue confirmation before treatment. Contraindications include uncorrectable bleeding disorders and a patient's inability to cooperate during the procedure. Although advanced chronic obstructive pulmonary disease (COPD) and deep lesions correspond to increased rates of pneumothorax, these are not contraindications. Development of a pneumothorax necessitating chest-tube placement is uncommon. As with fluoroscopy, the prone and supine positions are usually easy for a patient to assume and maintain. It is more difficult for patients to hold completely still if they are in an oblique position, but the use of bolsters can help stabilize their position. The decubitus position occasionally helps the clinician stay in an extrapleural location because the dependent hemithorax is compressed. If a pulmonary abscess is suspected, the decubitus position can help prevent flooding the contralateral lung with infected material during the procedure. Obtain the prothrombin time (PT) and an international normalized ratio (INR) in patients with known or suspected liver disease, in patients with known liver metastasis, or in patients receiving therapy with warfarin (Coumadin). Obtain activated partial thromboplastin time (aPTT) in patients receiving heparin. Obtain CBC counts in patients with a high risk of bleeding to determine their baseline hemoglobin concentration. Also obtain a CBC count in patients in whom thrombocytopenia is suspected. Obtain 2-view chest radiographs and CT scans even if the lesion will be sampled by using fluoroscopic guidance. Chest CT scans help in determining the depth of the lesion, the 3-dimensional relationship of the lesion with adjacent structures, and the safest route of approach. In general, the route closest to the skin and through the fewest pleural fissures is preferred. The risk of pneumothorax increases as increasing numbers of fissures are transgressed. For small lesions, a comparison of CT scans with the fluoroscopic views obtained during the procedure confirms that the faint shadow depicted on the monitor is the lesion to be aspirated. CT scans also are valuable for detecting additional pulmonary nodules or hilar or mediastinal adenopathy. Written informed consent is obtained, including consent for possible chest-tube placement. Most procedures are performed safely with local anesthesia alone. The patient should be informed and educated about the procedure, its benefits, and its risks. This information diminishes any apprehension or anxiety the patient may have and helps improve patient-physician cooperation and interaction during the procedure. The patient should be able to follow breathing instructions, and he or she should be acutely aware of any breathing difficulty or pain. If conscious sedation must be used, patients are assessed for sedation per institutional guidelines. An intravenous (IV) line is placed to deliver sedatives and resuscitation medications as needed. Sedation should be tailored to the needs of each patient, and it should account for the possible deleterious effects of decreased respiratory drive. Most patients can tolerate TNB well when given midazolam (Versed) 1-2 mg IV and fentanyl 50-100 mcg IV throughout the examination. Pulse oximetry, blood pressure, and heart rate are monitored, and a nurse who is given no other responsibilities administers the sedatives. Oxygen and tubing for oxygen delivery should be available, as are the reversal agents naloxone hydrochloride (Narcan) and flumazenil (Romazicon). A chest-tube insertion kit should be readily available in the biopsy suite. If CT is used during biopsy of a small nodule and if repeated breath holding is necessary, sedation may interfere with the examination. Once sedated, the patient may no longer be able to repetitively suspend his or her respiration in a similar fashion for imaging, needle placement, and confirmational imaging. This problem is not an issue the real-time methods of fluoroscopy, CT fluoroscopy, or ultrasonography are used. Before the advent of CT scanning, fluoroscopy was the method of choice for guiding transthoracic biopsies. Units with C-arms or biplane capabilities offer the best choice for a quick, easy, and accurate procedure. CT (and the less commonly used sonography) has gradually replaced fluoroscopy, not necessarily because they are a better method but because they are widely available. As discussed later, the use of ultrasonography to guide biopsy has limitations. However, in developing countries where fluoroscopic and CT units are scarce, the use of ultrasound machines to guide biopsy may be the only alternative, especially if nodules or masses are in the chest wall or peripheral pleura. Transthoracic needle biopsy (TNB) can be performed under fluoroscopic guidance in most lesions that can be demonstrated on chest radiographs. In the author's experience, the smaller the lesion, the more likely the biopsy will yield diagnostic material when fluoroscopy versus conventional static CT is used. If CT-fluoroscopy is available to the operator, the likelihood of obtaining diagnostic material is best. Considerations to address with the various TNB guidance methods are discussed below. Fluoroscopy is preferred in most patients with pulmonary parenchymal lesions if CT-fluoroscopy is unavailable. The smaller the lesion, the more likely it is that TNB performed under fluoroscopic guidance will successfully lead to diagnosis. Except in the CT-fluoroscopic technique, CT cannot compete with fluoroscopy in TNB of lung nodules. Fluoroscopy allows real-time tracking of the lesion as it moves with patient respiration. Because the lesion usually moves when the needle encounters it, real-time imaging helps ensure that the needle remains in the lesion or that it reenters the lesion as it is aspirated. A route that avoids the ribs and transverse processes can be selected easily. If the patient develops a pneumothorax and if the lesion must be aspirated additional times because the initial sample is inadequate, the approach can be adjusted rapidly to account for changes in the position of the lesions. With CT, rescanning the entire region is necessary to find the new position of the lesion, which may change rapidly. Posterior approach: The author prefers the posterior approach for fluoroscopy because the posterior ribs are revealed and readily avoided and because the patient cannot see the needle entering the chest. Anterior approach: Patients are usually most comfortable lying supine. The patient can easily get on and off the table from the supine position. The patient is also in position for rapid chest-tube placement if it is needed. Lateral or oblique approach: Any position that is not perpendicular to the floor can cause problems. Experience and a good C-arm or biplane fluoroscopic unit helps greatly. This approach can be difficult to use if the fluoroscope cannot be positioned obliquely, as in a basic radiography-fluoroscopy room. Moving the patient into an oblique position with the needle in place is not a good option because the movement of the muscles of the chest wall and the upper extremities deflect the needle. A rib or transverse process that appears to be in the way of needle advancement might be volume averaging on the section and not a true obstacle. Thin collimation can reveal what really lies ahead of the needle, but additional imaging is required because patient motion and respiratory variation are exaggerated. If the needle does encounter bone, the osseous structure can usually be avoided with slight manual displacement of the needle along with the superficial soft tissues of the needle track. Recall that the neurovascular structures are inferior to the posterior ribs; therefore, do not slip in under a posterior rib. Biopsy of a chest-wall or a pleural-based lesion is often simply and rapidly performed under ultrasonography guidance, which avoids exposing the patient and operator to ionizing radiation. If the lesion is in the chest wall, it is often readily depicted on sonograms. Pleural-based lesions are depicted even more readily than chest-wall lesions because acoustic reflection of the lung flanks the mass. CT-fluoroscopic guidance is reported to be a reliable and effective method, and it is becoming a popular technique as scanners with this capability become widely available. CT-fluoroscopy has replaced fluoroscopic guidance as the method of choice for guidance at the author's institution. For TNB of large pulmonary masses and for mediastinal or hilar lesions, CT-fluoroscopy can substantially reduce procedure time. Although small pulmonary nodules can be readily targeted with CT-fluoroscopy, it is still difficult to verify that the needle remains within the moving nodule as it is aspirated. The problem is due to the need to move the patient in and out of the imaging plane, which requires 1 hand, while simultaneously aspirating with and controlling the biopsy needle, which often requires 2 hands. In this situation, manual core biopsy (eg, with a Temno core gun; Bauer Medical International, Santo Domingo, Dominica Republic) can be definitive because the coring device can be demonstrated in position through the lesion before it is fired. A potential disadvantage of CT-fluoroscopy is exposure of the patient and operator to high doses to radiation. To minimize operator exposure, an approach that incorporates caudal-to-cranial or cranial-to-caudal angulation is best. The ribs make selecting such an approach in the thorax is made difficult. Machines capable of CT-fluoroscopy are often the best and fastest scanners in the department. It may be difficult to justify interrupting the throughput of patients for diagnostic scans to perform a procedure that is often just as easily performed by using a less expensive piece of equipment. As CT-fluoroscopy capable machines became ubiquitous, they replaced fluoroscopy as the method of choice. Vendors have yet to create an operator-friendly way of moving the patient in and out of the field. A rocking foot pedal may be extremely useful. For now, the present authors disarticulate a sterile 20-mL syringe and use the outer section as a sterile cover over the tiny handle that is used to move the patient in and out of the beam. This technique occupies 1 hand, making it more difficult to perform biopsy than it would be if the table could be controlled with a foot. Coaxial or single needles can be used; either type is acceptable. Radiologists performing TNB should be familiar with both techniques. To perform TNB in a patient with a lung nodule, the author uses a 22-gauge Chiba needle. The needle is typically 10-15 cm long, and the depth of placement is determined on CT scans, even if fluoroscopy is used for guidance. In many patients, the coaxial technique is best. The coaxial technique involves placement of the guide needle into position near or within the mass. A second device is placed through the guide needle to obtain tissue. The device used to obtain tissue may be an aspirating or cutting needle or a core gun. A typical coaxial setup includes an 18-gauge Chiba needle as the guide needle and a 22-gauge Chiba needle for fine-needle aspiration (FNA) or a 20-gauge gun to obtain a core (see image below). Coaxial approach with fluoroscopic guidance. An 18-gauge Chiba needle is advanced into the mass to serve as the guide needle. A 22-gauge Chiba needle is in position through the center of the guide. The smaller needle is used to obtain the sample. Although detailed imaging is needed to place the guide needle, the rest of the biopsy can be performed with little or no additional imaging. Both aspirates and cores can be obtained through the same access. The guide needle can be used to obtain a final, large-volume aspirate at the end of the procedure or to place a blood patch as the needle is withdrawn. Disadvantages of the coaxial technique include the creation of a large defect in the pleura and the risk that room air can be sucked into the chest through the outer needle when the inner needle is placed or removed. Regardless of the technique used to image or approach the lesion, the most critical member of successful TNB team is the cytopathologist. The radiologist and the cytopathologist form a team. Coordinate with the cytopathologist so that the specimen can be received and analyzed as soon as it is removed from the chest. An insufficient sample results in a repeated pass if possible. Additional tissue can complement a specimen that is almost diagnostic. The radiologist's impression may help the cytopathologist in narrowing the diagnosis. If a mass in the mediastinum can be aspirated without transgressing the pleura, the risk of pneumothorax diminishes to zero. Anterior mediastinal masses can often be accessed when the approach is through the sternum and avoids the pleura. Use an 18-gauge Chiba needle as a guide needle. The Chiba needle appears blunt, but it passes through the sternum with relatively little pressure applied while drilling. CT image obtained during trans-sternal coaxial fine-needle aspiration (FNA) of prevascular adenopathy. The path of the needle should be checked before the posterior cortex is penetrated. The periosteum on the far side of the posterior cortex is innervated. Be prepared to administer additional local anesthetic through the guide needle when it reaches the periosteum. Sensing the crossing of the posterior cortex is difficult because no give is felt as when the needle crosses the anterior cortex. Therefore, it is imperative to watch the depth of the guide needle to avoid going too deep. In addition, the patient feels pain when the innervated periosteum of the posterior sternal cortex is reached. After the guide needle is in the anterior mediastinum, use a curved 22-gauge Chiba needle to aspirate coaxially (see first image below). The patient may develop a pneumomediastinum but not a pneumothorax (see second image below). CT image obtained during trans-sternal coaxial fine-needle aspiration (FNA) of prevascular adenopathy. After the guide is in place, FNA and core samples can be rapidly obtained by means of a coaxial method. Image shows a slightly curved 22-gauge Chiba needle placed coaxially through the 18-gauge Chiba needle that was used to breech the sternum. By curving the 22-gauge tip, the FNA needle can be steered. Also, turning the hub during aspiration swings the tip through an arc; this maneuver allows the clinician to sample a volume of tissue greater than that obtained when the tip is straight. CT image obtained during trans-sternal coaxial fine-needle aspiration (FNA) of prevascular adenopathy. Note that air can collect harmlessly in the anterior mediastinum during this approach, but it will not cause a pneumothorax. Placing the needle through bone does not cause any more pain than placing it through soft tissue. Despite the lack of pain, use sedation because watching a needle being drilled through one's own sternum can be an unpleasant experience for patients. Although the procedure may appear to be painful, patients do not have any more pain with trans-sternal needle biopsy than with any other kind of biopsy procedure. Remember to use local anesthetic at both the superficial and deep periosteal layers of the sternum. A right paratracheal node is usually posterior to the superior vena cava (SVC). A 22-gauge needle may be placed safely through the SVC to reach the node. Use the coaxial technique. Place the tip of the 18-gauge guide needle just anterior to the SVC. Minimize the number of transvenous passes. 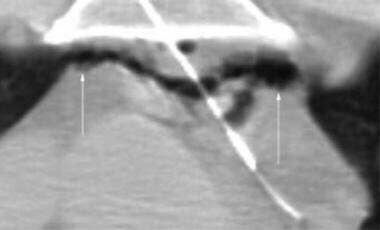 Combine the trans-sternal with the transvenous approach if needed to keep the track within the mediastinum (see image below). 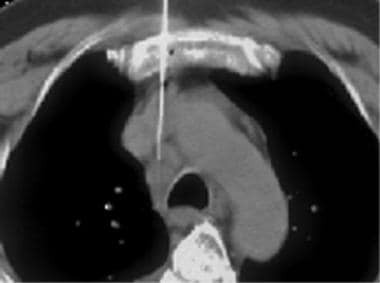 CT image obtained during trans-sternal transcaval coaxial fine-needle aspiration (FNA) of a right paratracheal adenopathy. For this approach, an 18-gauge guide is placed through the sternum but not through the superior vena cava (SVC). A 22-gauge Chiba needle is posteriorly advanced through the SVC into the nodes. Expect a tiny, insignificant amount of bleeding into the mediastinum. As long as the patient has normal coagulation parameters, no problem should ensue. Remember that the first aortograms were performed in similar fashion by passing an 18-gauge needle directly into the ascending aorta. Place the patient in the decubitus position to widen the extrapleural window (see image below). This positioning technique is especially useful for patients undergoing biopsy of an adrenal mass. With the patient prone, the route is narrowed. The margin of safety can be improved by placing the patient in the left lateral decubitus position. A clinical tip is this: When a procedure is performed with the patient in the prone position, note that the patient's left side is on the right, as shown on this prone image. Be sure to check the position of the liver and spleen. CT technicians are often confused when a patient is positioned prone, and with a keystroke, they can flip the image back and forth. Ensure that the correct side is being addressed. If the needle crossed or is suspected to have crossed the pleura, keep the patient recumbent after TNB. Slide the patient from the procedure table onto a gurney. Do not allow the patient to get up and ambulate or to sit in a wheelchair. As long as the patient is stable, do not rush to perform postprocedural chest radiography. Wait 30 minutes with the patient quietly relaxing on the bed. After 30 minutes, the postprocedural chest radiograph can be obtained. If no pneumothorax is present, the patient can begin to ambulate, eat a meal, and move around the hospital. A chest radiograph is obtained after 3 hours to exclude a delayed pneumothorax. The patient is discharged home if the delayed image shows no pneumothorax. If the patient develops a pneumothorax during TNB or if the first post-TNB chest radiograph demonstrates a pneumothorax, assess the patient's oxygen saturation and vital signs. If the vital signs are deteriorating or if the patient is complaining of heaviness in the chest or shortness of breath, treat the pneumothorax. If the patient is asymptomatic and if his or her vital signs are stable, have the patient rest quietly, breathing 2 L of oxygen given by nasal canula for 1 hour. Then, obtain a chest radiograph and look for signs of worsening or a stable, improving, or resolved pneumothorax. Patients with an unstable or symptomatic pneumothorax are treated with placement of a chest tube. An asymptomatic, stable, or resolving pneumothorax is not drained. In patients with such a finding, obtain another chest radiograph 4 hours after biopsy. If the patient remains asymptomatic and if the pneumothorax is stable or resolving, discharge the patient. If otherwise, place a chest tube. If the needle does not cross the pleura, such as during mediastinal or pleural-based TNB, a follow-up chest radiograph is not needed. Discharge the patient after 30 minutes of observation. A flowchart can be used to time chest radiography and to aid in patient disposition (see first image below). All chest radiographs must be obtained by using the same technique. The current author prefers the upright anteroposterior view with full expiration. The flowchart appears complex. In basic terms, if the patient develops an unstable or symptomatic pneumothorax, placement of a chest tube is warranted (see second image below). Full flowchart for patient care after transthoracic needle biopsy (TNB) in which aerated lung is penetrated. 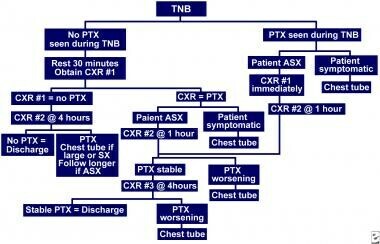 ASX = asymptomatic; CXR = chest radiography; PTX = pneumothorax; SX = symptomatic. Simplified flowchart for patient care after transthoracic needle biopsy (TNB) during which aerated lung was penetrated. CXR = chest radiography; D/C = discharge; PTX = pneumothorax. Complications are rare with transthoracic needle biopsy (TNB) as long as pneumothorax is considered part of the procedure. Obtain consent for chest-tube placement while consent for the TNB is obtained, and explain that the chest tube can be omitted most of the time. Pneumothorax only occurs in 20-33% of patients undergoing TNB; this rate is interesting given that a needle is purposefully passed into the lung. One technique that has been recently described is the rapid needle-out patient-rollover time after transthoracic biopsy. In a study of 201 patients  this approach reduced the rate of overall pneumothorax and pneumothorax requiring a drainage cathether. However, in a larger series of 1191 patients  this approach significantly reduced the rate of pneumothorax requiring a drainage catheter, but did not reduce the overall pneumothorax rate. Caution patients not to be alarmed if they cough up a teaspoonful, or even a tablespoonful, of blood. This small-volume hemoptysis is considered normal. A rare but potentially serious complication of TNB is air embolism to the systemic arterial tree. Air embolism occurs when a fistula is created between a pulmonary vein and an airway. Air bubbles into the pulmonary vein, returns to the left atrium, and exits the heart by means of the aorta. The coronary and intracranial arteries may be embolized, with subsequent stroke or myocardial infarction. Recovery is possible if the patient is placed into a hyperbaric chamber to reduce the size of the bubble. An air embolus can potentially be aspirated by using an angiographic microcatheter; however, to the author's knowledge, this has not been reported. The risk of air embolism is believed to increase in TNB of central lesions compared with TNB of peripheral lesions. Klein JS, Johnson A, Watson E, Mount S. CT-guided transthoracic needle biopsy in the diagnosis of sarcoidosis. J Thorac Imaging. 2009 Feb. 24(1):23-30. [Medline]. Kallenberg MH, Gill RR, Factor RE, et al. Diagnostic efficacy and safety of computed tomography-guided transthoracic needle biopsy in patients with hematologic malignancies. Acad Radiol. 2009 Nov. 16(11):1408-15. [Medline]. Tuna T, Ozkaya S, Dirican A, Findik S, Atici AG, Erkan L. Diagnostic efficacy of computed tomography-guided transthoracic needle aspiration and biopsy in patients with pulmonary disease. Onco Targets Ther. 2013. 6:1553-7. [Medline]. [Full Text]. Sinner WN. 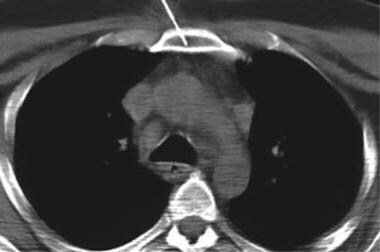 Pulmonary neoplasms diagnosed with transthoracic needle biopsy. Cancer. 1979 Apr. 43(4):1533-40. [Medline]. Yilmaz A, Uskul TB, Bayramgurler B, Baran R. Cell type accuracy of transthoracic fine needle aspiration material in primary lung cancer. Respirology. 2001 Jun. 6(2):91-4. [Medline]. Klein JS, Zarka MA. Transthoracic needle biopsy: an overview. J Thorac Imaging. 1997 Oct. 12(4):232-49. [Medline]. Salazar AM, Westcott JL. The role of transthoracic needle biopsy for the diagnosis and staging of lung cancer. Clin Chest Med. 1993 Mar. 14(1):99-110. [Medline]. Basnet SB, Thapa GB, Shahi R, Shrestha M, Panth R. Computed tomography guided percutaneous transthoracic fine needle aspiration cytology in chest masses. JNMA J Nepal Med Assoc. 2008 Jul-Sep. 47(171):123-7. [Medline]. Lee YS, Jin GY, Han YM, Chung MJ, Park HS. Computed tomography-guided transthoracic needle aspiration biopsy of intrapulmonary lesions: utility of a liquid-based cytopreparatory technique. Acta Cytol. 2008 Nov-Dec. 52(6):665-70. [Medline]. De Filippo M, Onniboni M, Rusca M, et al. Advantages of multidetector-row CT with multiplanar reformation in guiding percutaneous lung biopsies. Radiol Med. 2008 Oct. 113(7):945-53. [Medline]. Tomabechi M, Kato K, Sone M, et al. Cerebral air embolism treated with hyperbaric oxygen therapy following percutaneous transthoracic computed tomography-guided needle biopsy of the lung. Radiat Med. 2008 Jul. 26(6):379-83. [Medline]. Huang R, Jiang NC, Lu HH, et al. Precision of coaxial needle placement in computed tomography-guided transthoracic needle biopsy. Exp Ther Med. 2013 Nov. 6(5):1307-1311. [Medline]. [Full Text]. Langen HJ, Klose KC, Keulers P, Adam G, Jochims M, Gunther RW. Artificial widening of the mediastinum to gain access for extrapleural biopsy: clinical results. Radiology. 1995 Sep. 196(3):703-6. [Medline]. Sinner WN. 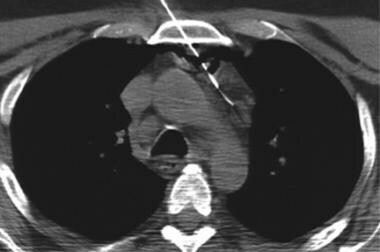 Complications of percutaneous transthoracic needle aspiration biopsy. Acta Radiol Diagn (Stockh). 1976 Nov. 17(6):813-28. [Medline]. Wiener RS, Schwartz LM, Woloshin S, Welch HG. Population-based risk for complications after transthoracic needle lung biopsy of a pulmonary nodule: an analysis of discharge records. Ann Intern Med. 2011 Aug 2. 155(3):137-44. [Medline]. [Full Text]. O'Neill AC, McCarthy C, Ridge CA, et al. Rapid needle-out patient-rollover time after percutaneous CT-guided transthoracic biopsy of lung nodules: effect on pneumothorax rate. Radiology. 2012 Jan. 262(1):314-9. [Medline]. Kim JI, Park CM, Lee SM, Goo JM. Rapid needle-out patient-rollover approach after cone beam CT-guided lung biopsy: effect on pneumothorax rate in 1,191 consecutive patients. Eur Radiol. 2015 Jul. 25 (7):1845-53. [Medline]. Kara M, Alver G, Sak SD, Kavukcu S. Implantation metastasis caused by fine needle aspiration biopsy following curative resection of stage IB non-small cell lung cancer. Eur J Cardiothorac Surg. 2001 Oct. 20(4):868-70. [Medline]. Spliethoff JW, Prevoo W, Meier MA, et al. Real-time in vivo tissue characterization with diffuse reflectance spectroscopy during transthoracic lung biopsy: a clinical feasibility study. Clin Cancer Res. 2015 Aug 31. [Medline]. Fontaine-Delaruelle C, Souquet PJ, Gamondes D, et al. Negative predictive value of transthoracic core-needle biopsy: a multicenter study. Chest. 2015 Aug. 148(2):472-80. [Medline]. CT image obtained during trans-sternal coaxial fine-needle aspiration (FNA) of prevascular adenopathy. An 18-gauge Chiba needle is advanced through the sternum into the anterior mediastinum. Then, a slightly curved 22-gauge Chiba needle is advanced through the guide and into the prevascular lymph node. CT image obtained during trans-sternal coaxial fine-needle aspiration (FNA) of prevascular adenopathy. Although crossing the sternum can look disturbing, this step is typically easy to perform and can be accomplished by applying forward pressure on an 18-gauge Chiba needle while it is slightly turned back and forth to screw it through the bone. The guide needle can be felt to advance after the anterior cortex is breached. Check the angle of approach before the posterior cortex is crossed, and remember to have local anesthetic available as the posterior periosteum is innervated; this helpful fact can be a clue that the posterior wall is breached. The lurch forward felt when the needle crosses the anterior cortex is typically not felt when it crosses the posterior cortex. This patient has a suspected recurrence of myxoid liposarcoma. 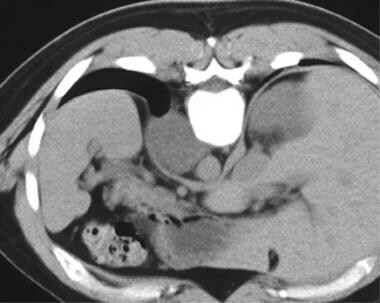 This CT image was obtained with the patient in the supine position. This mass can be approached through the small sliver of left paravertebral fat; thus, aerated lung can be avoided. Left retrocrural mass. The window for guiding placement is expanded by placing the patient's side of interest in the decubitus position. This position is particularly helpful when a biopsy of an adrenal gland is performed.